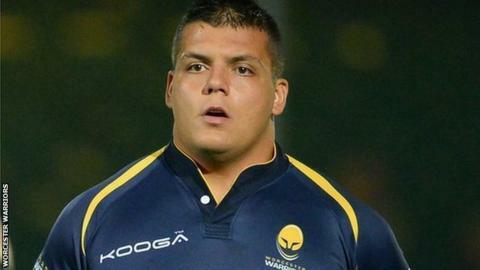 Worcester Warriors have strengthened their pack by signing young Romanian forward Alex Gordas. The 20-year-old tight-head prop, who has played for Romania through to Under-19 level, has progressed through the ranks at CSM Olimpia Bucuresti. "This is a really exciting opportunity for me," he said. "I'm delighted to move to England. Warriors are a great club with excellent facilities. "They have ambitious plans, which I want to be a part of." Warriors director of Rugby Dean Ryan said: "We have been very clear about our focus in developing young players. Alex represents someone who has come to England to progress as a rugby player. "He's in an ideal environment to do that. We will be working closely with him to ensure he maximises his potential." Gordas has already appeared in Warriors colours, having made his first appearance earlier this month as a trialist for the Cavaliers, the Warriors' second-string midweek team, against Gloucester United. Worcester, relegated from the Premiership in May, currently lie third in the Championship, having recovered from an opening day defeat at title rivals Bristol to win their next two matches.